All IGAWorks services are offered in the form of common modules + add-ons. In order to use services such as adbrix, adPOPcorn (OfferWall, DA), LiveOperation, Promotion, Coupon, Nanoo, etc., the add-ons must be integrated after common integration is completed. Download the latest version of the SDK common module file and the SDK add-on. 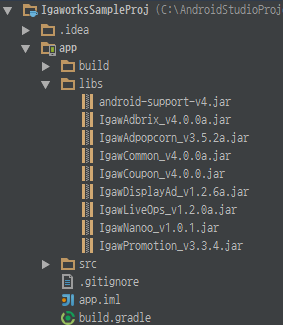 Copy the downloaded IgawCommon~*.jar file and the Igaw~*.jar files to the app/libs folder. Copy the files and confirm that the bundle.gradle file dependencies have been properly set. 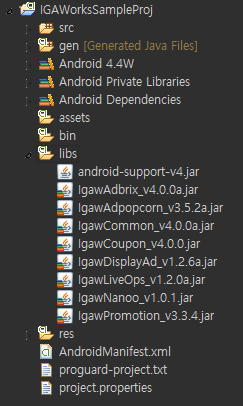 Copy the downloaded IgawCommon~*.jar file and the Igaw~*.jar files to the Project/libs folder. + Android Studio: Edit the app/proguard-rules.pro file. + Eclipse: Edit the Project/proguard-project.txt file.